This past week I attended the annual South by Southwest conference in Austin,TX. I can say with absolute certainty that virtual reality (VR) headsets dominated the conference. 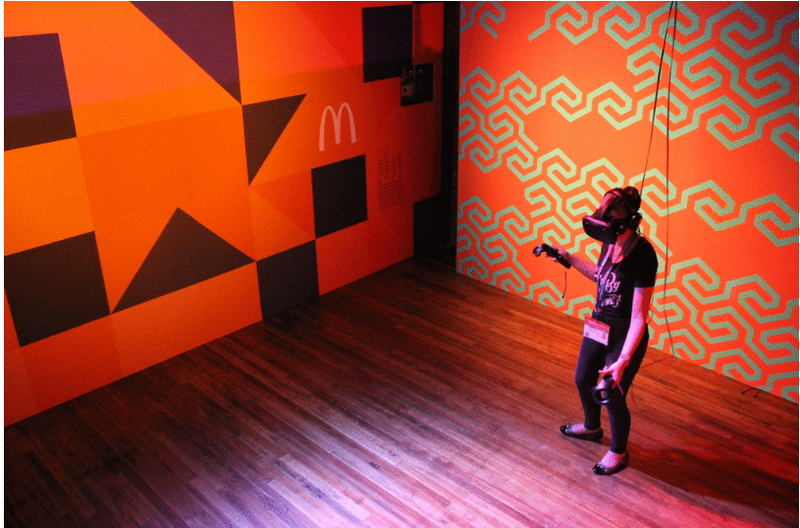 I got the chance to try out multiple headsets — one of my favorite VR Experiences took place inside the McDonald's Loft (yes McDonald's… and no it looked nothing like the stores). That’s where I got to try out Google’s Tilt Brush . “I want to go back! I have to go back!”. That was my favorite experience, until I discovered the Kodak Memory Observatory. I was walking around the convention center on Monday when I came across an interactive exhibit called “The Memory Observatory” sponsored by Kodak. The room looked dark and when I inquired the women at the door told me I’d be able to “step inside a memory” (video below). physical and digital, the memory and the experience, the personal and the shared. and experience their memories brought to life around you. I was met by plush, comfortable seating and soothing blacklights. The air felt crisp and comforting at the same time. A women entered the room with an iPad in hand. She was kind and spoke in a soft, soothing voice. On the iPad was the the image I texted earlier. This photo is from the rehearsal dinner the night before my wedding. It took place on the waterfront in Coronado, an island off San Diego. It was a perfect night and we never used any of the 30 heaters we rented. I was excited because it was the first time seeing friends and family and I was also feeling anticipation and nervous for the wedding the next day. How would you describe the smell of that day? What emotion did it evoke to think about a piece of fabric being passed down between generation? What were my hopes and dreams for the future? She asked about my husband and I described him. She was kind, sweet and attentive (if you’ve ever attended South by Southwest or a similar tech. conference you know how refreshing it is to have a conversation with someone face to face without the distractions of phones, crowd of people, long lines and general shop talk). Soon afterwards they were ready for me, and I was sent in the direction of the Memory Observatory. I didn’t know what to expect as I pulled the dark curtains to one side and walked into the room. The first thing I saw were people lying on the ground looking up at the ceiling. A gentleman by the door told me to make myself comfortable — so I did that, and laid my head on a color changing ball. That’s when I first noticed that it smelled like the ocean. I looked up at the ceiling to see my photograph projected overhead with mirrors covering every possible surface — creating multiple dimensions. Then I heard seagull which were overlaid with tranquil music. My photograph started to fade in and out in timed with audio of me describing the day and the smell of the ocean got stronger. The room felt warm and cozy, just like I’d described that evening. So there was the smell of the day, the sounds in the distance, lighting resembling a sunset, the visual image and my voice recalling that evening. It was truly a moving experience. Have you ever smelled something and been instantly transported back to a time in your life? Have you ever heard a song and a random memory pops up? Kodak did a great job combining all the elements from that photograph to create a truly multi sensory experience. In the future I can imagine a storefront that will curate and recreate your memories for you — even better a VR headset that will let you actually LIVE your memories. Imagine the possibilities.